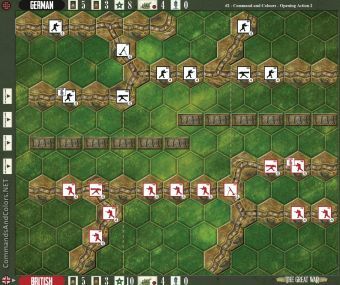 The two Tank Opening Action scenarios 19 and 20 are non-historical battles, expressly designed to gradually introduce you and a friend to the basics of WWI Tank warfare. Scenario 19 features two British Mark IV WWI tanks, one male and one female, while Scenario 20 adds a German A7V tank to the unit mix. 1 Medal for each soldier unit eliminated. Note, a British tank, when eliminated, is worth 2 Victory Medals. 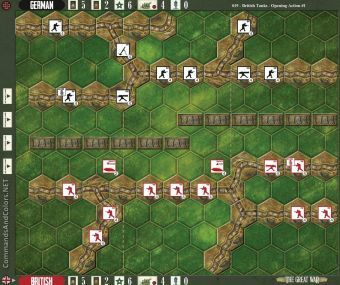 The British forces gain 1 Temporary Victory Medal at the start of their turn, when a British tank occupies any hex on the other side of the German front trench line. Place 1 Tank Silhouette token on each British Mark IV tank. As the British player you may also need a couple of Bogged Down markers. Set these markers next to the deck of command cards.